Members of Swiss team Zerotracer in front of the United Nations (UN) offices in Geneva, after they completed a 27,000 km round the world trip. Electric vehicles from Australia, Germany and Switzerland completed a pioneering 27,000 kilometre “emissions free” round-the-world trip on Thursday, after 188 days on the road and at sea. Electric vehicles from Australia, Germany and Switzerland completed a pioneering 27,000 kilometre “emissions free” round-the-world trip on Thursday, after 188 days on the road and at sea. 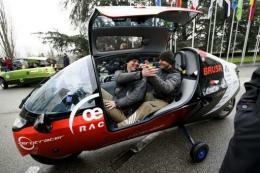 The three-wheeler dubbed “TREV” from Adelaide, a German electric scooter and a “Monotracer” high-tech motorcycle glided silently into the UN’s European headquarters about six months after they headed eastwards around the world. Organiser Louis Palmer, a Swiss schoolteacher who made headlines with his 18-month pioneering world tour in a solar-powered “taxi” three years ago, said the three experimental vehicles spent 80 days on the road. “We made it around the world in 80 days, we made it back here after 17 countries and 29,000 kilometres. We can’t believe it,” the clean car champion said. The UN-backed “Zero Race” stopped off at the World Climate Conference in Cancun, Mexico last December, after touring through Europe, Russia, China, Canada and the United States, before heading back through Morocco and Spain about a month behind schedule. “This shows what we are trying to preach, that it can be done. Cars powered by clean renewable energy can be as effective as petrol-driven vehicles but without emissions,” said Sylvie Motard of the UN Environment Programme (UNEP). However, the crews admitted they sometimes had trouble charging the vehicles even if they avoided major breakdowns. “It was very hard in some places, certainly for our team members in Russia China,” said Alexandra James, one of the 12 volunteers who took their turn driving the bright green Australian two-seater TREV. “They were wiring straight into the power supply in certain situations because it was the only way to get a reliable power source — it was a challenge,” James, a manager at the South Australia Technology Industry Association, told AFP. With some grid supplies on their way potentially being generated by high carbon sources such as coal, each team bought as much power as they consumed from renewable sources such as wind, solar and hydroelectric power, to claim an emissions-free tour. TREV — also Two Seater Renewable Energy Vehicle — was built by students at the University of South Australia and will carry on as an education tool. James and Christine Haydon, an electronics teacher at Tafe Regency Park college, took on the last leg from Morocco, six months after 57 year-old Adelaide electrical engineer Jason Jones and his son set out from Geneva. “We all work full time, so we had to take on legs with a team of 12 people. That way everyone got to drive,” said Haydon. One of the biggest problems turned out to be the South Australia licence plate – just TREV — especially with Russian border guards. “We had a lot of trouble with the number plate because people around the world want to have numbers and when we didn’t have numbers it was a problem,” said James. Posted on February 24, 2011, in Electric / Electronic and tagged automotive, e-mobility, e/e, electric, electric vehicle, electronic, emobility. Bookmark the permalink. Leave a comment.